Aging is inevitable … or is it? NAM President Victor J. Dzau will lead a panel discussion among four pioneers who are investing in science and technology that could stop the aging process in its tracks. 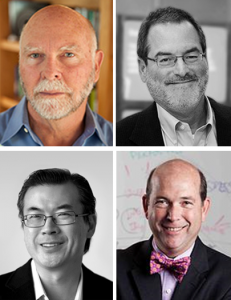 At Human Longevity, Inc., J. Craig Venter is building the world’s most comprehensive database of human genotypes and phenotypes to tackle diseases associated with aging. Hal Barron is President of R&D at Calico, a Google-backed company whose mission is to harness advanced technologies to increase our understanding of the biology that controls lifespan. Joon Yun is President of Palo Alto Investors, LLC, with $2.5 billion invested in health care, and the founder of the Palo Alto Prize, a $1 million life science competition dedicated to ending aging. At the MIT AgeLab, Joe Coughlin is pursuing innovative technologies to support caregiving and healthy aging, including “smart home” monitoring and specialized foods. Please join us for a lively conversation about outside-the-box thinking and disruptive innovations that could revolutionize the most universal issue in health. Space is limited, so register now! Registration for the session on Innovation in Aging and Longevity is FREE. Additional registration, including a fee of $150, is required to attend other sessions of the NAM Annual Meeting. To see the complete agenda and to register for the full scientific program, visit the meeting page.